Author(s): Marwa F. Mansour, Ehab F. El-Kady, Mona M. Abd El-Moety, Nabawia M. El-Guindi, Ann Van Schepdael, Farmaceutische Analyse KU Leuven, O&N2, PB 923, Herestraat 49, B-3000 Leuven, Belgium., Belgium	Samir M. El-Moghazy. Background: Mixed anxiety depressive disorder is commonly treated with a mixture of an antidepressant and a benzodiazepine drug. Quality control to ensure that these products comply with the specifications is required. To improve the quality control of pharmaceutical products throughout the world, accessible analytical methods are needed. 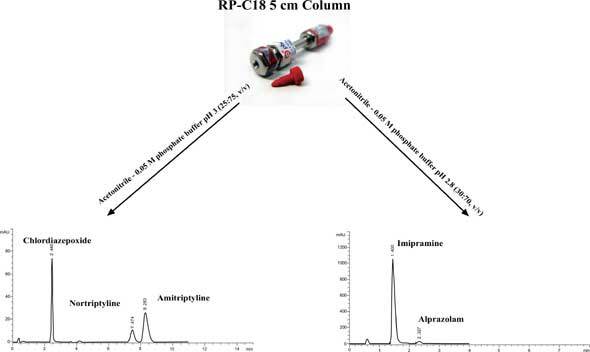 Objective: The aim was to develop fast, simple, cheap, accurate and easily accessible analytical methods for the simultaneous determination of selected antidepressant mixtures by high performance liquid chromatography. The first mixture contained amitriptyline, chlordiazepoxide and nortriptyline as an impurity of amitriptyline, while the second one was imipramine and alprazolam in a challenging component ratio. Method: Both chromatographic methods used a 5 cm length Phenomenex C18 column. The mobile phase was acetonitrile - 0.05 M phosphate buffer pH 3 (25:75, v/v) for the first mixture, and acetonitrile - 0.05 M phosphate buffer pH 2.8 (30:70, v/v) for the second mixture. The UV- detector was set at 240 nm. Results: The methods show good linearity in the range 0.1 - 100 µg mL-1 for both amitriptyline and chlordiazepoxide and 0.1 - 20 µg mL-1 for nortriptyline in the first mixture. The second mixture shows linearity over 1 - 400 µg mL-1 for imipramine while alprazolam was linear from 0.1 to 10 µg mL-1. The accuracy and precision of the methods have been determined by analyzing laboratory prepared pharmaceutical mixtures. Both methods proved to be specific, robust and accurate according to the International Conference on Harmonization guidelines and can be applied in quality control of these drugs. Keywords: Alprazolam, amitriptyline, chlordiazepoxide, imipramine, liquid chromatography, nortriptyline. Affiliation:Farmaceutische Analyse KU Leuven, O&N2, PB 923, Herestraat 49, B-3000 Leuven, Belgium. Keywords:Alprazolam, amitriptyline, chlordiazepoxide, imipramine, liquid chromatography, nortriptyline. Abstract:Background: Mixed anxiety depressive disorder is commonly treated with a mixture of an antidepressant and a benzodiazepine drug. Quality control to ensure that these products comply with the specifications is required. To improve the quality control of pharmaceutical products throughout the world, accessible analytical methods are needed.